ELEANOR P. LABROZZI PHOTO | The crowd of pink poses last Saturday at Crescent Beach. And so did the women, kids and dogs. 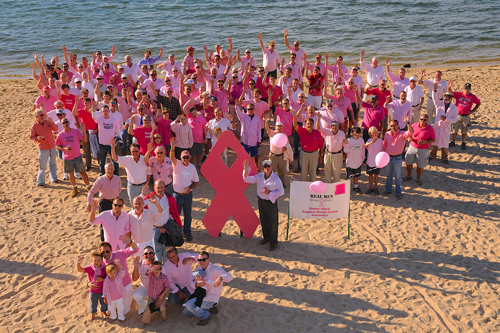 Pink was everywhere on Crescent Beach last Saturday when more than 200 people came together on a beautiful afternoon for the annual ‘Real Men Wear Pink’ photo shoot. The event was ‘not so much about raising money as it was about raising awareness,’ according to organizer Towny Montant, who started the event to honor his late wife, Teresa, who succumbed to breast cancer in 2011. Island businesses donated appetizers, served by members of the Shelter Island School National Honor Society. There was also a raffle and a bean bag toss for kids and adults, and a chance to sign up for “Team Flamingo,” which will participate in the Shelter Island 5K Run/Walk that takes place on Saturday, October 19. All proceeds go to the local breast cancer beneficiaries of the 5K. A committee of seven Islanders including Towny, Debbie Speeches, Ann Marie and Vinnie Seddio, Louise Clark and Anne and Bob DeStefano organized the event. Ann Marie and JoAnn Pushkin, both breast cancer survivors, spoke about the need for routine mammograms and the push for legislation for doctors to inform women if they have dense breast tissue. Most of all it was a chance to greet friends and offer support for a good cause. 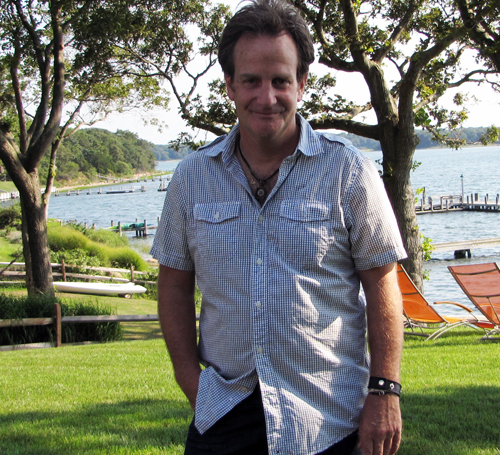 JULIE LANE PHOTO | Matthew Badger, father of three daughters who died in a Stamford, Conn. house fire last Christmas returned to Shelter Island last week to raise money for a foundation honoring the girls’ love of the arts. It was with a heavy heart but wonderful memories that Matthew Badger returned last Thursday to Shelter Island — the site of many happy days spent with his daughters. The girls — Lily, 9, and twins Sarah and Grace, 7 — died in an early Christmas Day fire at their mother’s home in Stamford, Connecticut. Madonna Badger, the girls’ mother, survived the blaze that also killed her parents, Lomer and Pauline Johnson. On Thursday night, Mr. Badger came back to the Island where he and his daughters had shared a love of swimming, fishing and other summer activities, to attend a fund raiser for the LilySarahGrace Fund that he founded last January to provide money for underfunded arts programs in public schools throughout the country. The girls were very creative and Mr. Badger wanted a means of memorializing them while helping other children with artistic abilities. Cash-strapped school districts have generally cut programs in the arts first, Mr. Badger said. Thursday’s fundraiser — organized by Clora Skibeli, Renee Barletta, Susan Petrie-Badertscher and Pom Shillingford at the residence of Helge and Clora Skibeli in Dering Harbor — raised $8,000 plus additional contributions pledged on the website at www.lilysarahgracefund.org, Ms. Petrie-Badertscher said. That will fund four or five projects that reach about 150 students, Mr. Badger said. Approximately 40 people attended the Thursday night event. “People were incredibly touched” by the presentation, Ms. Petrie-Badertscher said. Mr. Badger was quick to point out that at least 50 percent of the money the fund has raised in the past eight months didn’t come from donors with deep pockets. There were contributions of $5 from people throughout the country who heard about the fund through its website. One young man sent money he had received at his Bar Mitzvah, while another child sent proceeds from a lemonade stand, Mr. Badger said. Since January, the fund has dedicated $280,000 to pay expenses for creative programs in schools around the country, Mr. Badger said. Teachers submit applications through the website for funding various programs and a panel of teachers selects those it believes are most deserving. For the full story about the fund and the girls’ days on Shelter Island, see Thursday’s Reporter. Supporters will gather in Greenport Saturday to meet Olympians Amanda Clark of Shelter Island and her sailing partner Sarah Lihan of Florida, who will be competing in the women’s 470 boat races in the 2012 London Summer Olympics. The fundraiser at Hanff’s Boatyard at 190 Sterling Street will feature a video of the sailors in competition. Both women will be on hand to talk about their experiences and answer questions. For Ms. Clark, this will be her second Olympic competition. She competed with partner Sarah Chin in the 2008 Summer Olympics in Beijing, China, where the pair placed 12th. In 2004, she was an Olympic sailing team alternate. This year, Ms. Clark and Ms. Lihan are ranked sixth in the world by the International Sailing Federation. Saturday’s event will feature food prepared by Chef Dan Mannix and beer and wine provided by Greenport Harbor Brewery, Macari, Pindar and Old Fields vineyards and Clovis Point and Peconic Bay wineries. Organizers of the event are Ms. Clark’s parents, Ellen and Dennis Clark; Chef Mannix; Pat Mundus; Costello Marine; Nancy Morrow; and Wooden Boatworks. Tax deductible contributions of $100 can be made at the door on Saturday. The event is slated from 3 to 6 p.m. Supporters unable to attend who wish to make a contribution should call Ms. Clark’s husband, Greg Nissen, at 749-5444.